[MEDIA] - "VICTOR CROWLEY" Secret Hatchet Film Debuts in LA ! "VICTOR CROWLEY" Secret Hatchet Film Debuts in LA ! Dark Sky Films has just announced that Adam Green's "VICTOR CROWLEY", the fourth film in the Hatchet franchise is actually done. In fact it screened last night at Hollywood's ArcLight Cinema, shocking fans, celebrities, and industry professionals who gathered this evening to celebrate at an event coined as a “Hatchet 10th Anniversary Celebration. Set a decade after the events of the series' first three films, "VICTOR CROWLEY" reunites "HATCHET" mainstays Kane Hodder ("FRIDAY THE 13TH 7" to "JASON X"‘s Jason Voorhees) and Parry Shen ("BETTER LUCK TOMORROW") for an all-new, horrifying journey into the haunted, blood-drenched bayou. 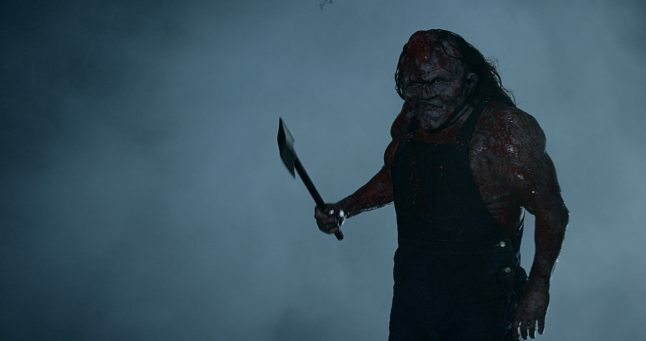 "VICTOR CROWLEY"'s ensemble cast also features Laura Ortiz (2006's "THE HILLS HAVE EYES"), Dave Sheridan ("SCARY MOVIE"), Brian Quinn, Tiffany Shepis ("TROMEO AND JULIET", "TERROR FIRMER", "THE BLACK ROOM" and Felissa Rose ("SLEEPAWAY CAMP", "SILENT NIGHT, ZOMBIE NIGHT"). I couldn't be happier to partner with Dark Sky Films and bring Victor Crowley back to horror fans around the world. Resurrecting the series for its tenth anniversary was our way of saying thank you to everyone in The Hatchet Army and beyond who have supported this series since its inception. This bloodbath is for all of you. "VICTOR CROWLEY" will hit select U.S. theaters in October 2017 as part of Dark Sky Films' “Victor Crowley Road Show”, wherein writer/director Adam Green (and other cast) will travel with and introduce the film at special one-night screening events across America. Internationally, the film is slated to bow at festivals worldwide – it will receive its international premiere this Saturday, August 26th at FrightFest in London, England. Adam Green and Kane Hodder will be in attendance for the gala screening. Synopsis : Ten years after the events of the original movie, Victor Crowley is mistakenly resurrected and proceeds to kill once more.